CTS 500k PUSH/PULL 3/8"- 3/4"
With this Reverse prewired Kit it is possible to switch the two pickups individually, in parallel and in series. 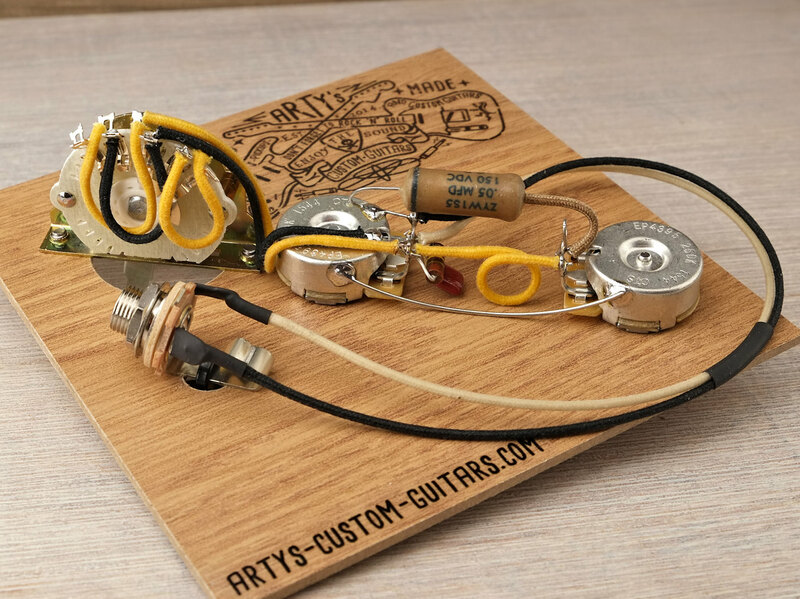 By connecting the two pickups in series a fourth additional louder and fatter sound is created. 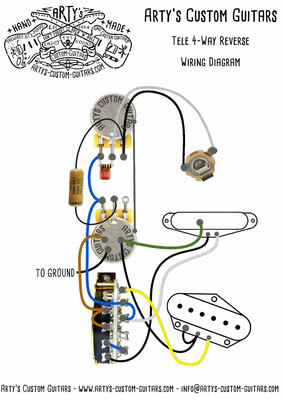 The Volume pot is arranged outside in the direction of the pickguard, the Tone pot in the middle and the switch at the very bottom. The prewired kit is equipped with a treble bleed mod. The Treble Bleed Mod allows you to use the volume pot over the entire bandwidth without losing the treble. This kit is available in all possible combinations. You can choose an Oak Grigsby (NEW) or CRL Switch, 250k or 500k potentiometers, and 0.022, 0.033, 0.047, 0.100 uf capacitors. To keep the variation selection clearer, we have listed only the most common combinations. For all other combinations please select a kit with your favorite switch, and specify the desired combination during the ordering process under remarks, for example "CRL 500k 0.033uF". The pots used are solid shaft CTS pots with 6.35 mm shaft diameter. This corresponds to the original US fender pots. For basses from Asia, Mexico and Europe, mostly 6 mm diameter split shaft pots are used, e.g. also in the Strat models. This means that the buttons may have to be slightly drilled out or replaced, but are usually possible without any problems. Each kit is also optionally available with split shaft pots of the same quality upon request (please before purchase). WE SHIP WORLDWIDE. The shipping costs for most EU countries are € 12,- (free shipping from € 250,-). You can find more information about the EU and WORLDWIDE shipping costs under the link directly below the product costs (inkl. Mwst., zzgl. 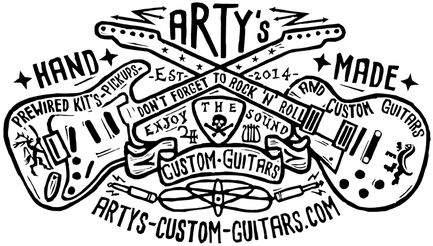 Versandkosten). If your destination country is not listed here, please contact us to calculate the shipping costs. If you need help with the checkout form or payment, please don't hestitate to contact us via e-mail. We just need your address and the designation of the desired items. As soon as we have received the above information, we will send you the detailed invoice. 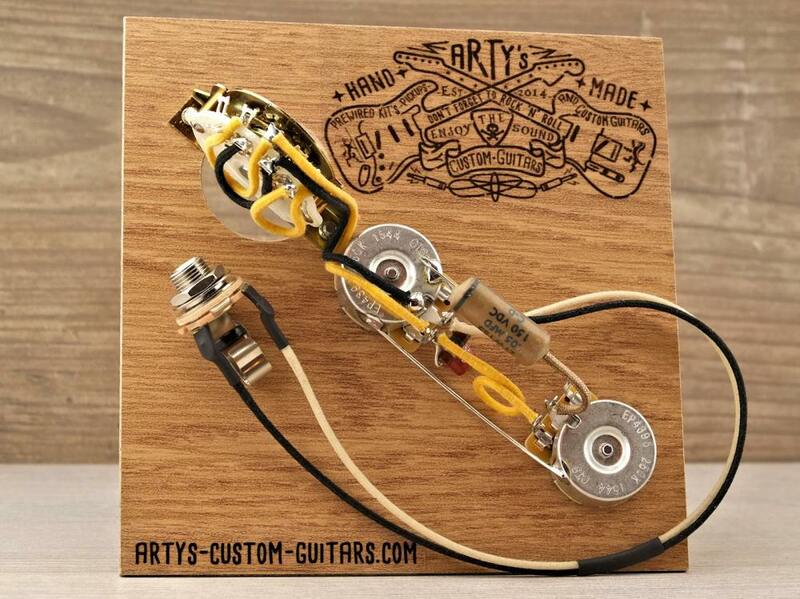 Why a Prewired GUITAR WIRING HArness from Arty's Custom Guitars? BECAUSE WE ARE ONLY SATISFIED WITH THE BEST. All our prewired kits have matched pots and caps. This means that we measure all potentiometers and capacitors before installation, select them, and use them according to their values where they deliver the best possible result in combination with the pickups. This is important because original pots have tolerances of up to +-20%. In extreme cases, a 500k pot can have values of only 400k or up to 600k ohms. Not infrequently good pickups are replaced unnecessarily, because they sound muddy, weak or thin. 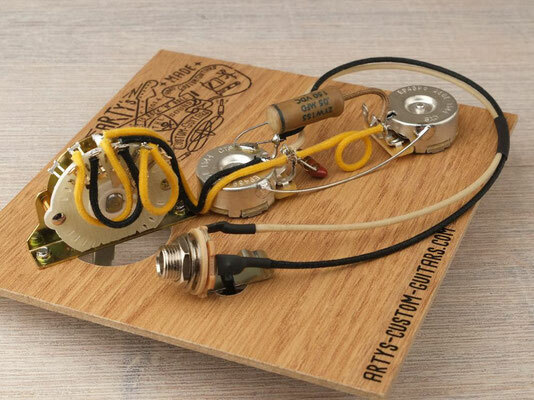 In reality, however, the problem is often not due to bad pickups, but simply to inferior wiring, which mercilessly destroys the actually perfect sound. We compared enormous quantities of capacitors in interaction with various pickups and thus determined the most suitable tone caps under real conditions. The capacitors are hand-selected HQ film capacitors with very low tolerance, very similar in design to the originals from the fifties. The vintage paper wax skin gives the caps an additional look. Our capacitors are so close to the originals of the 50's that nobody will hear a difference. In all our kits only the best components from well-known manufacturers like CTS, Switchcraft, CRL or Oak Grigsby are used. All kits are carefully manufactured in small quantities and professionally handcrafted, and delivered to satisfied customers all over the world. WIR FREUEN UNS AUF DEINE ANFRAGE! WE LOOK FORWARD TO YOUR REQUEST! Fender®, Stratocaster®, Telecaster®, Precision Bass®, Jazz Bass®, Esquire®, Thinline®, Strat® und Tele® sind eingetragene Markennamen der FENDER MUSICAL INSTRUMENTS CORPORATION. Gibson®, LesPaul®,SG®, ES-335®, ES-175®, ES-339®, ES-295®, Explorer®, Flying V® sind eingetragene Warenzeichen der Gibson Guitar Corporation. Sämtliche Rechte liegen bei den jeweiligen Urhebern. 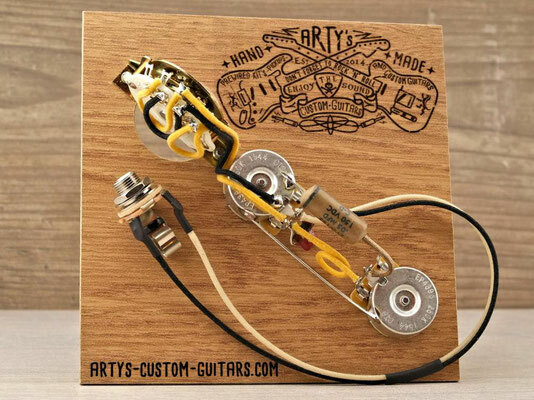 Arty's Custom Guitars steht in keiner Verbindung zu den genannten Unternehmen und deren Produkten. Sämtliche Fotos und Texte dieser Seite sind im Besitz von Arty's Custom Guitars/Rene Terp, und unterliegen dem Urheberrecht.